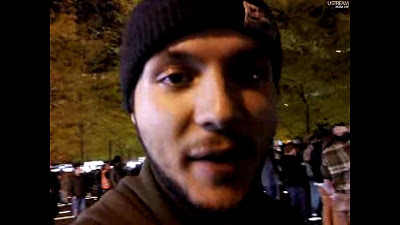 Protestor turned guerrilla journalist Tim Pool has made waves on the internet and beyond with his live Ustream coverage of the Occupy Wall Street Movement (OWS). Originally from Chicago, Tim was spending time in Los Angeles & Virginia building robots and skateboarding before heading for New York City. Tim saw what was happening with the OWS movement and decided to join the movement during its first week back in early September. 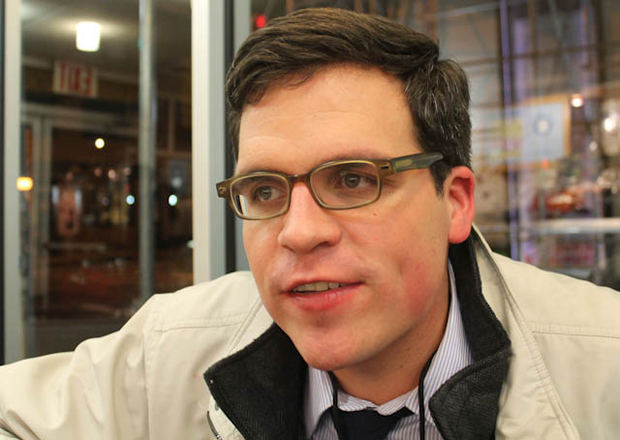 He has been involved with other grassroots movements in the past such as the No Blood for Oil anti-Iraq-war campaign, Greenpeace, and Environment America. During one of his live Ustream feeds, Tim was asked by another protestor what his job was. He replied “freelancing”, which is just about the most vague job description you can give. I later learned that he was working as a freelance videographer and web designer. Not like it matters anyways, Tim has set up a small office in SoHo for theother99, his new startup media company. Tim would like to turn his guerrilla Ustream journalism into a legitimate and profitable business. The outlook is already looking good – I predict he may get sponsorships from Verizon mobile, Samsung, or Energizer… His only equipment initially was a 4G Samsung Galaxy S II Android smartphone running the Ustream Android Market App. He was using Verizon’s 4G unlimited data plan to stream video wirelessly, which apparently is not being offered any longer. He also purchased an initial single Energizer XPAL battery pack to keep his phone juiced up over long periods. After gaining huge popularity on his Ustream channel, some viewers ended up heading to Zuccotti Park and donated extra XPAL battery packs to Tim. By mid-day Tim had a bunch of the $150+ battery packs and was ready to stream non-stop without ever worrying about running out of juice. I also heard Tim mention that he may be getting sponsored by Ustream who would supply a mobile operations backpack containing multiple high-capacity batteries, some better video equipment, and a more complex array of wireless cellular broadband transmitters. As of November 24th it seems he is still using the trusty Galaxy S II to do daily streaming. He has gotten his hands on a small remote-controlled helicopter with attached video camera however, which should rival shots taken by multi-million-dollar news choppers. I had checked out wearetheother99 and a few other streams on and off since the start of OWS. I would check them out fairly often, mostly when I knew an action was happening. There were never more than a couple hundred viewers watching at one point. That is, until November 15th. Just after midnight on November 15th the NYPD raided Zuccotti Park, the park in which protestors had occupied for the last 2 months. I was alerted to the NYPD raid through Reddit and quickly rushed to see if any streams were up and running. I ended up on wearetheother99’s UStream, it was the only one that I could find that was broadcasting live. Within 5 minutes I watched as an unknown voice behind the camera ran over barriers and snuck through police lines, all with the intention of capturing images of police raiding the park. Police kept protestors well away from the park during the raid, so Tim took a risk in trying to get a good view. This stream is getting interesting already. After watching for about half-an-hour, I finally learned about Tim Pool. Tim was continuing to stream when he came across a group of masked protestors, all dressed in black. He moved up closer to the mysterious figures, they were all crouched down in a circle beside an NYPD vehicle. He was quick to proclaim “THESE ARE BLAC BLOCK ANARCHISTS!” and one of them quickly appeared out of the huddled group and got into Tim’s face. He was yelling at Tim to stop filming and tried to cover the lens. Just as quickly, Tim stepped back and refused to take his camera off of them. He saw that they were letting the air out of the police vehicles. After a heated argument and some pushing and shoving from the shrouded man, Tim held his ground and continued to film. This was all the while shouting things like “THIS ACCOMPLISHES NOTHING” and “THESE PEOPLE ARE NOT OWS” at the group of people. At this point, Tim was simultaneously – live streaming the illegal activities of extremist Anarchists, standing up to all 6 or so of them and exposing them to the other protestors, and dodging punches from a masked man who was clearly bigger than him. I was totally hooked by this point. This was far more entertaining than anything that could have been on TV or YouTube at the time. After the altercation was over, Tim turned around his Galaxy S II and began talking into the camera explaining what had happened. This is when the world finally caught a glimpse of Tim Pool. By this point, the viewer count was doubling every couple of minutes or so, several thousands of viewers were tuning in. Tim’s live stream of the event went on throughout the early morning of November 15th. He claimed that he had been awake since the previous morning and he had already been streaming most of the day to a smaller audience. Eventually he was able to get around some NYPD barriers and fences and crossed over the street to get a good shot of city maintenance workers in the park. They were throwing away tents, garbage, and power washing the concrete urban park. There were no other cameras this close to the park at the time, Tim and a few others were corralled into a fenced in area. He kept his smartphone streaming while the fenced in area was surrounded by police officers and sealed off. They were trapped in this pen surrounded by officers trying to keep them away from the park. He walked around the fence calling out the name and badge numbers of the officers to the Ustream viewers while they quickly spammed the chat box relaying his every word. One officer covered up his badge number with his baton and Tim was quick to loudly criticize him for his actions. With no hope of getting any closer to the action in the park, Tim told the officers he wanted to get back into the street. After some persuasion, and a flash of his home-made press pass, an officer dismantled a section of the fence and let him back into the crowded street among the protestors. Tim’s live stream continued throughout the day of November 15th. The rest of the day was just as intense as the morning. Eventually when the cleanup was finished, protestors surrounded the park. The park remained fenced in and was surrounded by a strong police line for most of the day. At a couple of points in the day individual protestors broke through the police line into the park just to be quickly arrested. Eventually when the clean-up was finished protestors were allowed back into the park, but items such as sleeping bags and tents were prohibited and access was tightly controlled. Protestors in the park were forbidden from sleeping or even laying down for the entire night. Tim was among these protestors all day – filming, commentating, and relaying crowd chants & messages for the Ustream viewers. At one point during the afternoon Tim accidentally gave away his cellphone number to a friend while streaming, and trolls were quick to flood Tim with calls and text messasges. This knocked the stream off-the-air quite a few times. Tim told the people watching that he appreciated the support and the kind words he was getting from callers, but that he had to continue the stream and they were interrupting it. He took a short break; running to the Verizon store down the street, to change his phone number. He was back to streaming in no time, his only “break” of the day was over quickly. With a little help from his friend Henry Ferry, founder of wearetheother99, they were able to maintain a constant live stream for well over 20 hours straight. This stream takes the mainstream news media’s cliche tag-lines – uncensored, raw, and uncut to a level never reached before. During the early morning the stream peaked at about 20,000 simultaneous viewers and ended up with a quarter of a million unique views that day. As things finally wound down in the late evening, Tim signed off and headed “home” to bed after being awake for almost 2 days straight. November 16th was a less eventful day for OWS, which was a good thing for Tim. Tim was catching up on some much-needed rest to cover the November 17th day of action, it was the OWS 2 month anniversary march. The morning of the 17th Tim was up bright and early and was in Zuccotti Park (Liberty Square) by 7:00 am waiting for everyone to arrive. After about an hour the park was full of thousands of protestors eager to take to the streets. The NYPD however, had different plans for the day. Protestors were quickly stopped and were told they did not have a parade permit and were not allowed to march in the streets. The police attempted to kettle the marchers onto the sidewalks but the crowds moved quickly into areas unexpected by the police. The goal of the protestors was to march on Wall Street and interrupt the opening of the financial markets at the New York Stock Exchange (NYSE). Mayor Bloomberg made his goal clear as well – he stated that the protestors would not get anywhere near the NYSE that day. There were at least three news helicopters in the air during the march, which Tim made sure the internet viewers saw as well. I knew that the best footage of the march was not going to be shot from news media helicopters flying above, it was already coming to me live from the lens of Tim’s smartphone. Once the mainstream media realized this too, a few major news networks began to re-broadcast Tim’s Ustream feed. His stream was quickly becoming a global phenomenon, almost a million people were seeing Tim’s perspective of the march. People all around were recognizing him as Tim “The Ustream guy” he had become famous among the protestors over the past two days. A lot of people were approaching Tim telling him that his stream of the protest inspired them to come down and take part. Others were commending him as a hero for doing the live broadcast, he told them he has done nothing special. At one point he even had women approaching him telling him he was cute and asking for his Facebook or Twitter alias. He never let any of this get to his head. He was 100% committed to his viewers and nothing in his control was going to interrupt the broadcast. As the day progressed the march went on. The NYPD made dozens of arrests, there were even a few close calls for Tim. The march eventually came to a halt at Foley Square; directly across from city hall, where an announcement was made that there were thousands of other protestors on their way. Several unions and a huge group of NYU students were gathering in solidarity with the OWS protestors. They had just completed an action to occupy the subway systems to spread the OWS message to commuters heading home from work. When they arrived to Foley Square a giant general assembly (GA) was held to discuss issues such as student debt, economic instability, and a bleak job market for new graduates. Foley Square was jam packed with well over 30,000 protestors demonstrating in solidarity, it was a beautiful thing. Tim was right in the middle of it all, he was more enthusiastic & energetic than ever. He conducted some great interviews and offered his online viewers a unique personal perspective into the demonstration. This coverage gave armchair activists a feeling of actually being involved in the movement. Tim even made a joke of it being like a first person shooter video game at one point. After a few hours of demonstrating in the square, protestors planned on marching the Brooklyn Bridge. This was another action which Mayor Bloomberg denied he would let happen. By dusk there were thousands of protestors making the long walk along the bridge, all were keeping to the pedestrian walkways. The Brooklyn bridge is apparently notorious for very poor cellphone service.Tim was only able to get a few minutes of streaming on the bridge before he lost his cellular data connection. Between Tim and Henry streaming, wearetheother99 still had the most consistant livestream of the day. Before it cut out however, Tim was showing off the hundreds of cars slowly driving by, all honking and waving out of their windows at the marchers. It was a truly heart warming experience seeing so many citizens of New York showing their support, even if the action was slowing traffic. This ends my almost 48 hours total of being hooked to my computer watching the wearetheother99’s broadcast. At one point there was a small fire in my apartment building and I had to evacuate. I ran through the smoked filled hallway and quickly got into my car and continued streaming on the mobile app, I was addicted. Ustream now has an archive of the broadcast, split into dozens of parts. The thrill of watching it happen live will not be there though. Tim claimed to have used over 10GB of network data live streaming this event over 2 days. Overall wearetheother99’s Ustream feed got almost 1 million unique views over the three days, as well as unaccounted viewership numbers from the times it was being re-broadcasted by other media sources. Tim Pool is no hero. He is just driven and courageous. He might slide into obscurity just as quickly as he came up, but he is a great representative of the modern male – He used the very limited resources he had at his disposal and created something which was superior to the mass news media coverage. He eloquently and accurately contributed his knowledge and experience of the OWS movement through his ongoing commentary to his viewership. He provided a live, uncut, and uncensored first-person perspective of a now historic social movement. He was never afraid to say what was on his mind and he never tried to hide his political motivations. He never backed down when faced with adversities or danger. He was fiercely determined to succeeded at providing an alternative news source which gave people around the world a realistic perspective of the OWS movement. This is all while remaining calm, unabashed, level-headed, and very modest. A little piece of advice corporate owned news media outlets (like you are reading this) – you should hire Tim Pool before he ends up turning the world against your mostly biased and always commercialized news coverage. He is truly a man’s man and a great poster boy for the 99%. The internet and the Occupy movement together is a force to be reckoned with. I can’t wait to see what Tim, Henry, and wearetheother99 have in store for us next.